Enjoy this unique cabin with 4307 sq. feet of living space. Gorgeous pine throughout. In addition there is 1292 sq. feet of covered outdoor living area on beautiful redwood decks and balconies. This is the perfect setting for your Brian Head rental. The main floor is actually 'upstairs,' and consists of a large family/living room with a beautiful stone fireplace, a big table, plus four-chair bar and a full kitchen. The cabin is equipped with high speed wireless internet. The living room has a 47' LCD screen TV, & DVD with Apple TV. The cabin has a large new wing with a pool table room, 4 new bedrooms with king beds and 2 jack & jill bathrooms. The kitchen has been totally remodeled with new cupboards,granite countertops, and all new stainless steel Kitchen Aid appliances. On the upper level there is also a bath with jacuzzi tub, another bedroom with queen-size bed, and a quiet reading room. Downstairs is the perfect master bedroom hideaway. A gas stove/fireplace keeps this room cozy year round and with a massage chair and a large over-stuffed one you are both set. The bathroom with a second jacuzzi tub is part of this beautiful room. Get cozy with a book in a chair or watch your favorite program on the second TV, with DVD player. The large French doors open up to a wonderful new sunroom. It is a wonderful quiet get away room that looks out on pine trees and sky. The sun-room also has a sofa sleeper and can be used separately as a 7th bedroom if you would like. Downstairs is also a great kid area. There is a full-size bed and 2 twin beds. There are also bean bag chairs, toy box, TV, VCR, and lots of room for sleeping bags and kids to play. A full bath is there for the kids also. Downstairs in the new wing is a large mud room with a 2nd refrigerator and laundry room. Enjoy the space of this beautiful vacation rental cabin with a total of 6 bedrooms, plus the basement kids nook and sunroom, 5 bathrooms, beds for 18 and up to 25 people allowed (if the last 7 are small children). The upstairs bedrooms each have a french door opening onto a wrap-around redwood deck. The new redwood deck has 2 covered patio areas, one on each level. The upstairs deck contains a gas barbeque grill, table and chairs. The cabin has been completely resided outside and has a brand new roof. There is one parking space available in the new 845 sq. foot garage and lots of parking outside on the circular drive. There is a firepit area in the front yard. 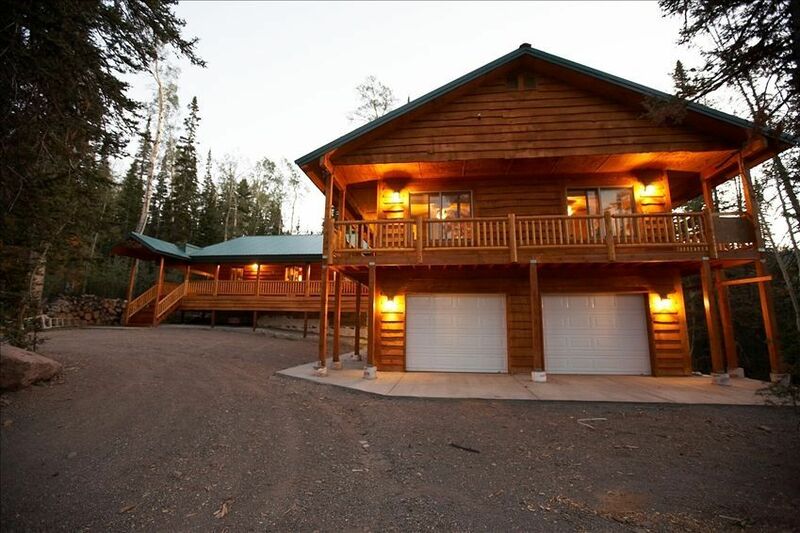 Located right in the heart of Brian Head with easy access to FREE shuttles to ski lifts, this Brian Head rental cabin is perfect for your winter or summer vacation and family reunion. The Cool Mountain retreat vacation rental sits on one-half acre of land so there is plenty of privacy and forest all around. The porch swing is the perfect place to feel the fresh air and hear the wind in the trees! Nothing could be more peaceful. Brian Head is close to Zion National Park, Bryce Canyon National Park, Cedar Breaks National Monument, and Cedar City's Tony Award winning Utah Shakespearean Festival. Mountain bike rentals, tours, and trail maps are available right in town. There is cross-country skiing as well as the Ski Resort. A spa is also located a couple blocks away in the lodge. There are good restaurants as close as a five-minute walk or a 30-minute drive to Cedar City. Drive from Brian Head across one of the newest of America's Byways-Route 143 to Panguitch Lake. Enjoy the spectacular beauty of southern Utah for your vacation. There is another vacation rental cabin on an adjoining lot available at this location. The other cabin, Spruce Street is a 6 bedroom, Kids nook, 4.5 bath cabin with 4144 sq. feet of living space, 368 sq. feet of deck and a 676 sq. foot garage-1 parking space available. This cabin also sleeps 18 in beds with a maximum of 25 people allowed (children included). TOGETHER these two cabins can accommodate 45 people and have the 12 bedrooms listed. The pricing listed here is for ONE cabin only. Both cabins are the same price. Summer or winter, between the great activities available and the comfort and pleasure at this vacation rental home, your vacation will be all you want it to be! ADDITIONAL INFORMATION: The pricing on this listing is for ONE cabin only. Each cabin is the same price. The amenities, pictures and prices listed below are for the Cool Mountain Retreat. For Spruce Cabin information please see 'All My Rental Listings'. We have loved coming to this small, uncrowded, yet charming resort town with our family for years. We love the skiing in the winter and the fresh, cool mountain air all summer. The cabin has all the amenities for a luxurious vacation and the space for your family and friends. Enjoy truly beautiful surroundings set in the beauty of the mountains. This cabin is nestled in the pines. We have an outdoor fire pit to enjoy the forest evenings around. Beautiful new 600ct. sheets. A down comforter and a quilt on each bed. Most anything you'll need to whip up and serve any meal. 3 tv's Bigscreen in the Family room has Apple TV Available. Just log in you favorite streaming channels. The cabin has 1292 sq. feet of new redwood deck--fabulous covered outdoor living space. 2 Fireplaces, 1 gas, 1 woodburning, DSL both wireless or plug in access, 1- Apple TV, 2 VCR's, another regular TV, 2 Jetted Tubs, A firepit for use in the front yard is perfect for those cool mountain evenings.